Why choose an Xact Live Link? Up-to-the-minute - accounting history you view through an Xact Live Link in Act! is current - no overnight processing delays. Accuracy, what you see is how it is! - when a customer calls looking for credit approval, your sales staff can rely on the accounts receivable information viewed in the accounting tab in Act! as accurate. Our sync free design ensures that. True workflow - CRM and accounting information all in one place- no swapping between Act! and your accounting screen. Other, old-style, links for Act! rely on opening accounting software installed on your PC just to create transactions or even simply to link an Act! record with an accounting record. Anytime availability for all users - business accounting software often limits the number of simultaneous user connections. Because the Xact Live Link uses smart channel-sharing technology you have unimpeded access to accounting for all your sales staff irrespective of the number of accounting licenses held. No intensive 'catch up processing'. 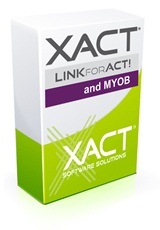 Xact Live Links do not add load to your back-office systems to synchronize data each night. No need to move all the daily transaction history, invoices, estimates, etc from accounting into Act! The Xact Link for Act! and QuickBooks is the original and only live connection to selected QuickBooks accounting products for Act! Pro and Premium. Infuse QuickBooks Online with Act! for Web to provide seamless integration, allowing your team to be readily informed of customer sales process through Estimates and Invoices. Link Act! with Xero, the world's easiest accounting software! The Xact Link for Act! and Xero helps you operate more efficiently by eliminating dual entry of data and exposing core functionality of Xero's directly from Act!.. The Xact Link for Act! and MYOB is an application which allows Act! users to connect to selected MYOB accounting products; in doing so it enables users to view MYOB customer information, and update and enter customer data to MYOB - all from within Act!. The Xact Link for Accredo enables the front-office to back-office workflow that small to medium business owners have been asking for, using everyday business software they are familiar with – no need for expensive corporate solutions. The Xact Link for Act! and Sage One helps you operate more efficiently by eliminating dual entry of data and exposing key Sage One features directly from ACT!. QuoteWerks, the market leader in sales quoting and proposal software for over 10 years, now integrates with Xero through Quote to Cloud from Xact Software.